In the world of crop research as in the fashion industry, there are super-models, mere models, spectators and rank outsiders. Make no bones about it, trusty old cassava (Manihot esculenta) is a crop of very modest beginnings, but now finally strutting the research catwalk alongside the biggest and the best. An ancient crop thought to have been first domesticated in Latin America more than 10,000 years ago, it was exported by Portuguese slave traders from Brazil to Africa in the 16th century as a cheap source of carbohydrates. From there, today we travel half a millennium forward in time – and in space, on to Ghana – to catch up with the latest on cassava in the 21st century. Come on a guided tour with Elizabeth Parkes (pictured), of Ghana’s Crops Research Institute (CRI, of the Council for Scientific and Industrial Research, CSIR), currently on leave of absence at the International Institute of Tropical Agriculture (IITA). 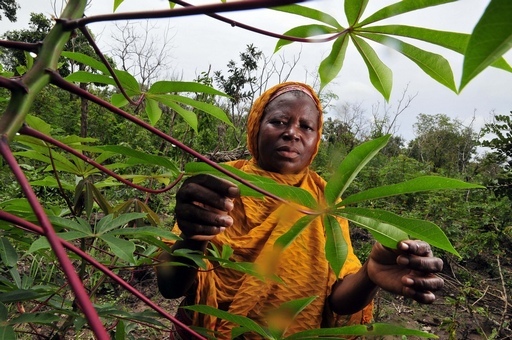 In keeping with its humble heritage, cassava is a crop which has long been reputed for being more than a little worn through at the elbows, commonly known as a “poor man’s crop” according to GCP cassava breeder and researcher, Elizabeth Parkes. However, much like a dishevelled duffle coat, what the crop lacks in shimmer and shine, it makes up for in sturdiness and dependability, rising to the occasion time and again by filling a critical gap – that of putting food in bellies – with a readiness and ease that its more sophisticated crop relatives have often struggled to keep up with. Elizabeth explains: “It has kept people alive over the years.” By the same token, the crop – now one of Africa’s most important staples – is fondly known in Ghana as bankye, meaning a ‘gift from the government’, thanks to its reliability and capacity to meet needs that other crops cannot. There is even a popular song in the country which pays homage to the crop as an indefatigable evergreen, conquering even the most willful and wily of weeds! However, as cassava experts such as Elizabeth know only too well, behind this well-intentioned lyrical window dressing is the poignant story of a crop badly in need of a pressing pick-me-up. Hardy as it may seem on the surface, cassava is riddled with myriad problems of a political, physiological, environmental and socioeconomic nature, further compounded by the interactions between these. For starters, while it may be a timeless classic and a must-have item at the family table for a good part of Africa, à la mode it is not, or at least not for short-sighted policy-makers looking first and foremost to tighten their purse strings in straitened times, or for quick-fix, rapid-impact, silver-bullet solutions: “African governments don’t invest many resources in research. Money is so meager, and funds have mostly come from external agencies looking to develop major cereals such as rice. Cassava has been ignored and has suffered a handicap as a result – it’s more or less an orphan crop now,” Elizabeth laments. Besides having to bear witness to their favourite outfit being left on the funding shelf, cassava breeders such as Elizabeth are also faced with a hotchpotch of hurdles in the field: “In addition to factors such as pests and disease, cassava is a long-season and very labour-intensive crop. It can take a whole year before you can expect to reap any rewards, and if you don’t have a strong team who can step in at different points throughout the breeding process, you can often find unexpected results at the end of it, and then you have to start all over again,” Elizabeth reveals. Robust as it may be, then, cassava is no easy customer in the field: “After making crosses, you don’t have many seeds to move you to the next level, simply because with cassava, you just don’t get the numbers: some are not compatible, some are not flowering; it’s a real bottleneck that needs to be overcome,” she affirms. And at the ready to flex their research muscles and rise to these considerable challenges was Elizabeth and her Ghanaian CRI team, who – with GCP support and in unison with colleagues from across Africa and the wider GCP cassava community – have been working flat out to put cassava firmly back on the research runway. A cassava farmer in Northern Ghana. Similar work was also conducted in Nigeria and Guatemala. So has this tremendous and tenacious teamwork proved strong enough to drag cassava out of the doldrums? Elizabeth certainly seems to think so: “Thanks to funders such as GCP, who recognised that we couldn’t afford to turn a blind eye to the plight of this struggling crop, cassava has been given a voice. Having worked together to understand the peculiarities of this crop, cassava is no longer just a poor man’s staple: beyond subsistence, it is becoming a crop of high starch quality, and of real use for industry, confectionary and even biofuels,” she enthuses. Thankfully, it’s a most welcome change of tide that shows no sign of abating any time soon. Human capacity, Elizabeth says, is going from strength to strength, with three GCP-funded Ghanaian postgraduate students advancing well, two of them working on PhDs in what would normally be considered, according to Elizabeth, a ‘no-go area’ of cassava research – that is, cassava drought tolerance and post-harvest physiological deterioration (PPD), as well as bio-fortification. Efforts by the CRI team have resulted in the release of some 14–15 new drought-tolerant and PPD-resistant varieties in Ghana to date; all are anticipated to have a long shelf-life, and other varieties are also in the pipeline. Biofortified seeds are in the making, with a view to soon mainstream biofortification in the team’s breeding activities. The biofortification work is in collaboration with a sister CGIAR Challenge Programme, HarvestPlus. Forthcoming plans for Elizabeth and her cassava companions in Ghana include a GCP Cassava Challenge Initiative project which will seek to unearth new marker populations and materials which are drought-tolerant and resistant to cassava mosaic virus and cassava bacterial blight. The team has successfully introgressed materials from CIAT into their landraces, and the next step will be to gauge how best the new genes will react to these traits of interest. In terms of people power, the CRI biotechnology laboratory built with GCP support – and now a regionally accredited ‘Centre of Excellence’ – is a hive of activity for local and international scientists alike, and is consequently bolstering cassava research efforts in the wider subregion. “The impact of our GCP-supported research on cassava has been remarkable. Above all, it’s been the community spirit which has moved things forward so effectively; in this respect, I think researchers working on other crops might want to borrow a leaf from the cassava book!” Elizabeth ventures. Thus, dusted down and ‘marked-up’ with a molecular make-over well underway, all evidence now suggests that this once old-hat subsistence crop is en route to becoming the next season’s big research hit, with shiny new cassava varieties soon to be released at a field station near you! Go, Ghana, go!